I was eating Christmas cake at the weekend, I “accidentally” slipped a box of mince pies into my basket yesterday…..I hold my hands up I love Christmas treats! If I am not careful my healthy diet could go down hill from here. 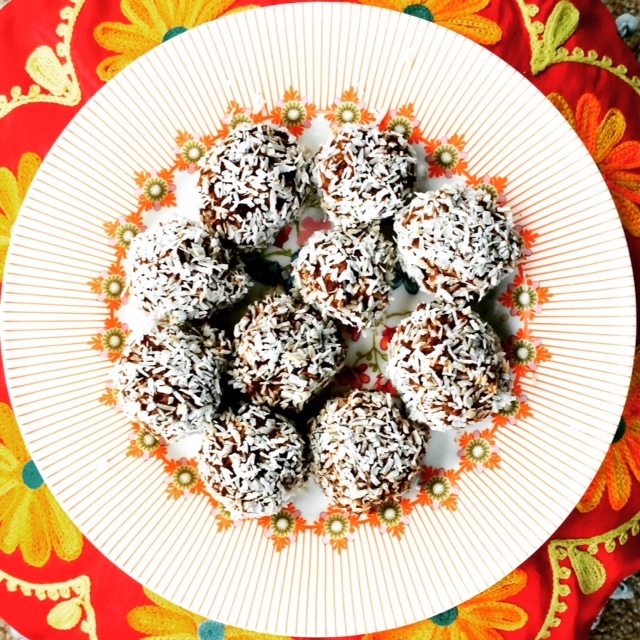 It’s time to bring out a healthy sweet treat – coconut bliss balls, to minimise the risk of eating mince pies every single day for the next 3 weeks. As yummy as they are it just won’t make me feel very good in the long run. 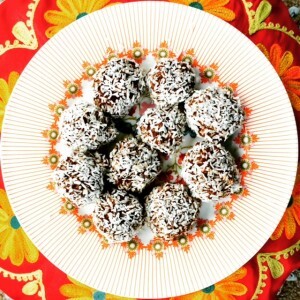 Coconut bliss balls are still sweet and they are still yummy, they are just good for you as well! Also depending on what you put in them they can be energy releasing too which can really help around this busy time. I mixed it all together to create a paste that I could then roll into little balls. Which I then rolled in some coconut, then stuck in the fridge to chill and set. Voila! Simple to make and delicious to eat. This entry was posted in Healthy Recipes on December 8, 2015 by louise. Isn’t it funny how often the things that help and support us the most go out of the window when we most need them? Yoga, meditation, prayer, journaling, affirmations…..are all amazing tools to help us navigate our way through life but often when a busy or stressful time hits they can easily be the things to be “too busy” for. This is the time when they are most helpful! I have just had a crazy busy month, aside from all my yoga classes I’ve taught on a retreat, I’ve run two 3 day corporate training courses up North, I’ve run a workshop and I’ve been up in Manchester sorting a lovely lady out with her winter wardrobe (I’m also a personal stylist!). It’s been a month of focus, time management and energy management! Amazingly I feel connected to my own yoga practice more than ever. Yoga in my hotel room! Hopefully this will serve you on the run up to Christmas, a special time that can sometime leave us pulled in different directions! If you’d like some help creating a self practice I am running a workshop on this in January, 9th, 2-5pm. Bookings through me! This entry was posted in Yoga on December 1, 2015 by louise.